A UN report (PDF) issued shortly after the 2013 Ghouta attack seems to denote this as Impact Site Number 4, one of only five sites they were able to visit, and one of only three in the core Zamalka-Ain Tarma area of the East Ghouta attack. The location is pretty clear and agreed by everyone. There was some cursory analysis of this at ACLOS, finding a possible direction by damage and burning, perhaps caused by the dome of fire caused by this FUEL-AIR EXPLOSIVE weapon (in which case it clearly could not have dispersed much sarin). At right, one view showing the main burned-ground area, which is also where the wall is knocked out for a second span. This can be seen on the left in the big panorama below, compared to rocket impact on the right (panorama by Chris Kabusk, 2014). At the time, I mapped these features as shown to the right. That suggested damage "dome" about 35-40 meters wide. Damage is heavy at impact (all mechanical? ), and along the orange curve, with a suggested sort of "doughnut" of calm between them. I still don't know if this is how it works, but Petri Krohn, who knows a bit more, seems to agree this looks like an FAE blast. It impacted perhaps at an angle with the wall of 71° as shown, and thus a direction to firing spot of about 348° NNW. This is far from exact, even dubious from a non-expert who still can't find good reference images for FAE blast damage patterns to compare... but it seems roughly the angle of the rocket body as seen on video. Indeed, the UN's provided angle would put it only about 5-10 degrees from the wall, which seems grossly wrong, doesn't it? We'll consider this in more detail below. I always though the green line range seemed about right, and the FAE clues had me favoring the upper end, or even a hair more to the north. 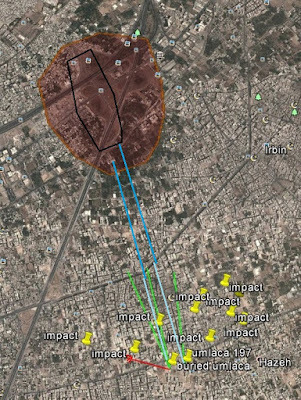 "Sasa Wawa" concluded from this an the other famous field impact that "The rockets were launched from a location north to Zamalka," and also noted how all 12 impacts seem to form a (rough) arc around a certain basic spot to the north-northwest. That's tempting, and about where I was. At right: "Sasa Wawa" graphic with my FAE-clue blue lines added. This could refine their brown firing area to my black area. 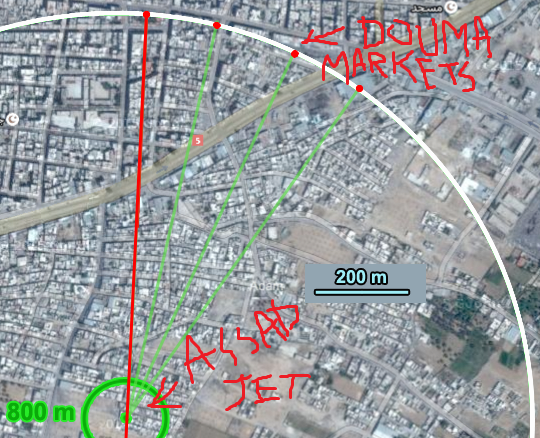 But ... even if one or two or three rockets were fired from this singular spot, it's not a clean and obvious arc of attack like we got with the Douma market attack in 2015. That mapping (explained here) is shown for good measure below, with helpful labels. The red dots are exactly where the alleged missiles from jets impacted on separate passes, and always from the south, that we can tell. Signs suggest the rockets fired from the ground 800m south were fuel-air explosive. About 100 previously massacred people (see here or here) had their deaths blamed on this fake jet attack, almost surely by the Saudi-backed Jaish al-Islam group that dominates the area). That's a clear and perfect arc (each firing at same distance, nothing but even turns of 11 degrees between them), with just one obvious center. 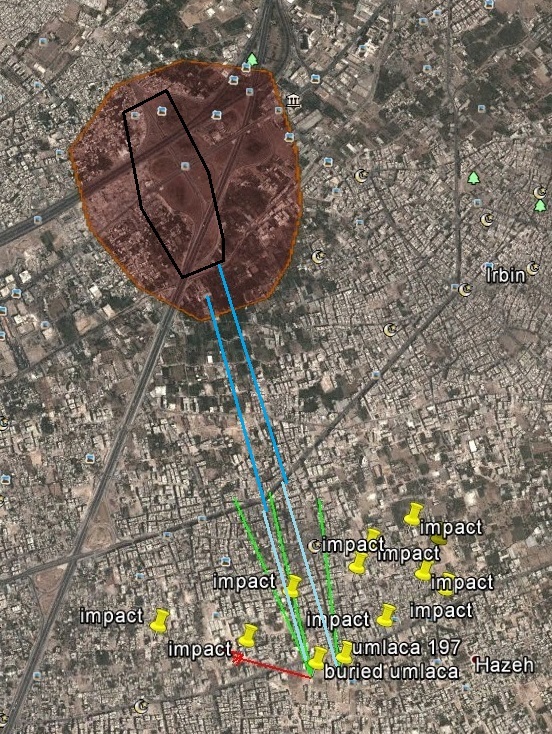 In comparison to that, the West Ghouta attack has a fuzzy and ill-defined bean-shaped impact field. Distances were clearly varied, if there's one firing spot (a fuller knowledge of angles could say). And there might be a different direction for other rockets. In fact, it seems likely there are two firing directions, or even more, involved in this Ghouta attack, with some coming from the north, and some - including this one - actually coming more from the northwest (but still on nothing like the UN's red line). Michael Kobs on Twitter find from video analysis that the rocket's angle almost lines up with the last apartment building before a gap (see here), about the second window in, and this place does have an open ground floor at the corner, as shown (Google Earth, 2/10/2012 shows it well). 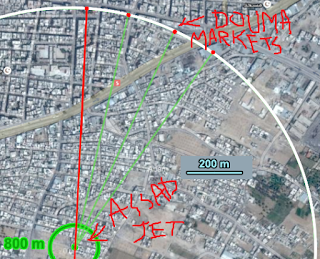 Another view Kobs used in that analysis shows the rocket looking "straight up" or facing along the implied trajectory, lining up with this dark area, leading to the red-line linkage in the image shown here. This line runs well left of the lonely tree in between blocks (blue circle, inside a wall, at the end of the forward block). That yields a direction back of about 315°. This challenged where I was, but it seems about right, if debatable; perspective issues with the line-up between images might need considered more. I'd say it's maybe more towards the tree, so about 318-322°, or in or near that range. But this is getting more solid. I noticed another view shows the rocket from a nice side-view, and helped set up the exact impact location in satellite views on Google Earth that partly show the relevant features. It seems almost half of this little building closest to impact is torn down, with a frame member holding the windows keeping the west half together. East wall: gone. South wall 1/3 gone, north wall 1/2 gone. That last section is about 1/2 windows (orange line), and one window-width to the east (app. same line, ground level) is where the trajectory crosses the wall, and just a hair out from that is where the rocket hit. The intact building corner gets a red line. It seems the same line from from this to impact center is also the line to the camera (marked in purple, all rough). So the trajectory, seeing it almost exactly from the side, will be perpendicular to this line of sight, so about like the gray bar crossing it (lower right inset, and sorry it's sloppy). This comes out 325 degrees, 48° from the wall. But it's not exactly a side-view. I assess the tail slants a little further away from the camera on the right side, making the approach angle a couple of degrees lower. 321-323° seems reasonable, and very close to the other good visual analysis by Kobs. My FAE burn ring analysis is likely still valid, just incomplete. If I could see all the details, it would probably suggest the same path. And eight degrees is way out there in "what?" territory. Did the UN really say that? Apparently. Eight degrees, or even five? When everyone else sees between 38 and 71? Can that be right? Yes. It seems this really is their reading; it must have come in nearly parallel to the wall, and if you had been there, you could see that plainly from the way it was aligned. You can't see it on a video of them being there, only from being there in person with Islamist minders looking over your shoulder and NATO folks, Turks, Saudis, and Israelis breathing down your neck. Sorry... a special and priveleged kind of science will emerge in such conditions. Outsiders cannot understand nor, obviously, can they challenge it. So... this is impact sites 1 AND 2, besides #4, for a total of three that show direction, of the five sites total they looked at. This leaves only three sites possible in the East Ghouta area, out of a supposed 12. These would be the rooftop impact, another home interior they're seen examining (neither scene reliably placed), and the one field site they're seen at. They're clearly seen at no other sites except going to or from their vehicles or driving around. Elsewhere in the report, they say the rockets appear to have come from an unspecified "northwest," which seems accurate enough. But the 285 only direction they published is barely northwest, just 15 degrees north of due west. The report states the rocket points at azimuth 285. However, as shown here this implies a 5 degree angle to the wall, which the screenshots below (same scene shown above) show cannot be the case:"
I get 8 degrees, which is still about as far off - around 30 degrees or more off - from all reasonable readings. But before these and other problems were known, and people might feel more free to make things up - the direction claim and its implications were hungrily swallowed and defecated by the mainstream media's presstitutes. The unexplained specifics "buried" in the unbiased and reliable UN report report, were dug out easily and interpreted as implicating the government. This supposed fact was trumpeted in the following days. The chances of this being some kind of attack by someone outside the Syrian government, already slim, basically have to drop to zero now, assuming you trust the UN’s facts as presented. That sounds about right. Added to all the other intelligence pointing in the same direction, there’s really no longer any case to be made that this was some kind of false-flag rebel operation. 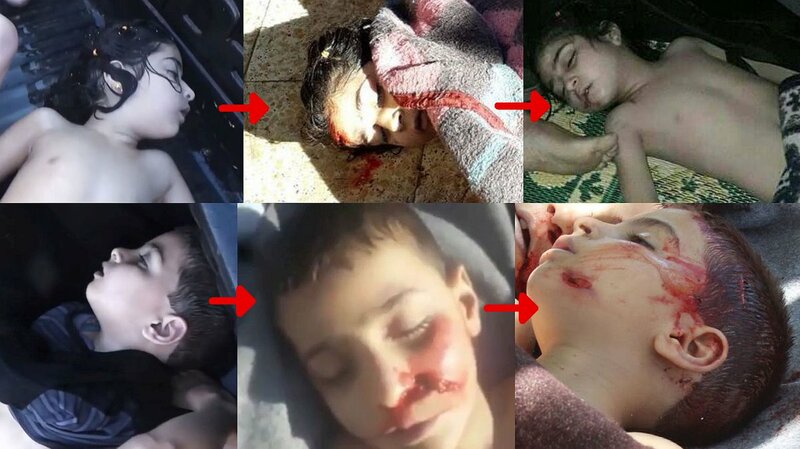 It was a chemical weapons attack mounted by the Assad government. Sorry, Rush. And HRW was there to notice it, and to produce the widely re-used graphic. They won't ever mention how it's a baseless claim that's scientifically impossible, and plainly contradicted by the visual evidence. It's got no apparent science behind it, other than maybe the science of falsely assigning blame just as the U.S. and allies were using that pre-decided blame to exert leverage on Syria and its allies. And HRW was there to help. Huh! C.J. Chivers, New York Times on the 18th heralded: "some of the strongest findings to date that suggest the government gassed its own people" were simply "buried" (not planted) in the report from investigators "instructed to investigate the attack but not to assign blame." 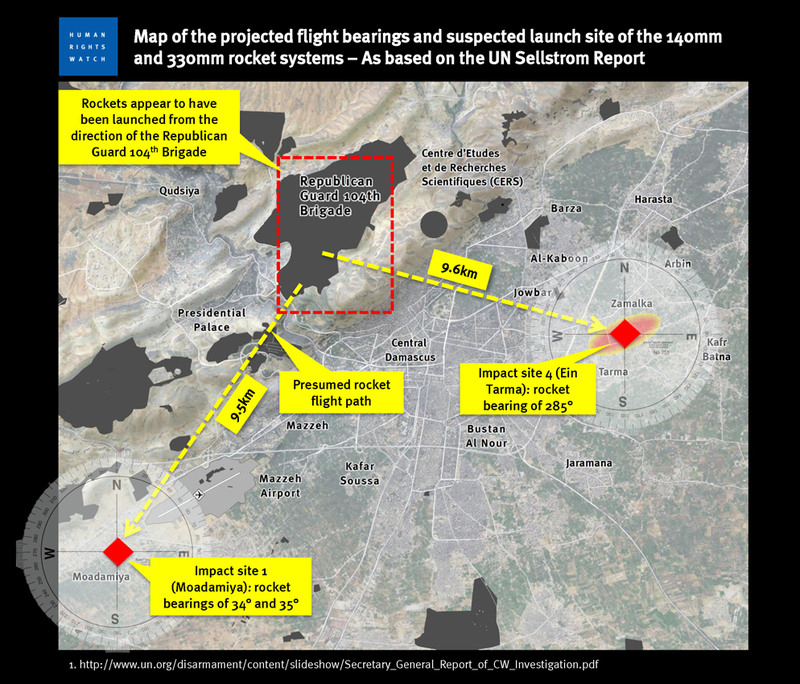 But they "listed the precise compass directions of flight for two rocket strikes that appeared to lead back toward the government’s elite redoubt in Damascus, Mount Qasioun, which overlooks and protects neighborhoods and Mr. Assad’s presidential palace and where his Republican Guard and the army’s powerful Fourth Division are entrenched." A retired Lebanese general, Elias Hanna, told Chivers this was “It is the center of gravity of the regime, "... the core of the regime." That sounds like John Kerry's "the heart of regime territory." Sept 4: "We are certain that none of the opposition has the weapons or capacity to effect a strike of this scale – particularly from the heart of regime territory." WH press office, Aug 30: "Satellite detections" showed "rocket launches from regime controlled territory early in the morning, approximately 90 minutes before the first report of a chemical attack appeared in social media." This itself is possible - it might be a different firing. 90 minutes is quite a while to presume it must be related. So this is what U.S. intel was saying in late Aug. early Sept. - distance vague, but from maps at the time, app. 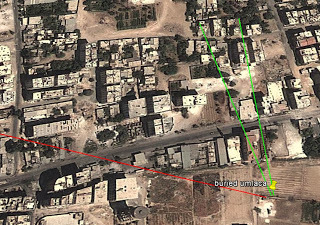 10 km from the true heart, 5-6 km from the edge, and whatever from any specific missile site, at least on the path the UN so "precisely" found. The suggested distance there is about 9km, depending from where in the base, etc. ... proven impossible by a wide margin. later, "precise" but grossly wrong readings are provided by UN investigators, and used to widely reinforce the false claims. How does this happen? where they claim to have observed "In the final stage of this trajectory, the projectile hit and pierced through a vegetal screen existing over one of the adjacent walls, before impacting the ground producing a shallow crater." "The line linking the crater and the piercing in the vegetal screen can be conclusively established and has a bearing of 35 degrees. This line represents an inverse azimuth to the original trajectory of the rocket, that is to say, the original trajectory of the projectile, as it hit the ground, had an azimuth of 215 degrees. Impact Site Number 2 is located 65 meters away from number I and with an azimuth of 214 degrees. Both relative positions are fully congruent with the dispersion pattern commonly associated with rockets launched from a single, multi-barrel, launcher. Coincidentally, these also pointed to Mount Qassioun! 60% of impacts looked at point there, and the rest nowhere. But from what we can read, 100% point other directions, and none point to the Assad base that's too far away anyways. 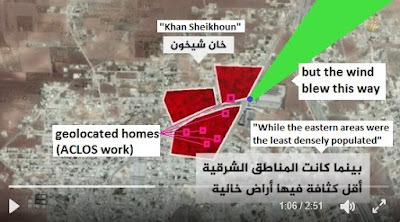 First, a detailed analysis of the Moadamiyah site indicates that, (a) unlike Zamalka, there was probably no chemical attack at this site, (b) even if we assume there was one, there is no evidence tying the M14 to a chemical attack, (c) the UN trajectory calculation is based on a dent in the floor that is unlikely to be a rocket impact site, and (d) the UN speculate that the rocket has previously hit another building before reaching the site. Researcher "Qoppa999" (hereafter Qoppa) publish an analysis on Twitter back on June 30, that deserves more attention. 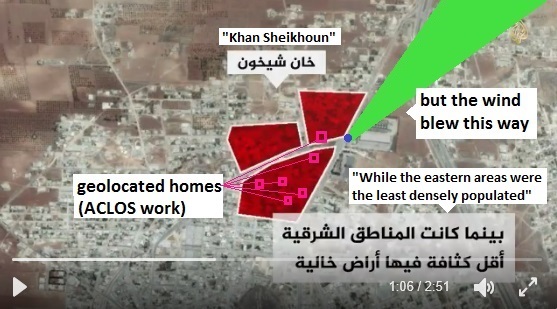 (See this tweet thread: "Following the trail of blood: A deeper look into the lethal center of the Khan Sheikhoun massacre.") I've been slow to finish this blog post to relate the important findings therein. His work identifies two children seen unharmed under opposition care and then later murdered, or at least wounded/mutilated with weapons or tools. Qoppa also offers name identifications for these children: as it happens, a brother and sister of the Imad Al-Din (Imadeddin) Al-Qadah family, aged 5 and 8. These are related by marriage, at multiple points, to the central target family Al-Yousef, at least as the records are presented (ACLOS). The ID seems like deduction from batches of victims, with some anchors to provided name-to-face matches. It's not the most certain ID but seems good, as explained below, and so I'll use these names. 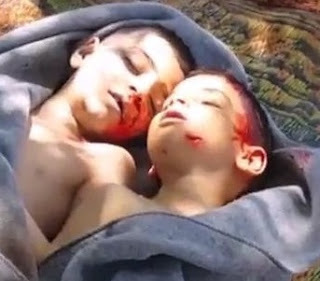 Note: regardless of identities, based on the matching, these two children were badly damaged while under opposition care, physically killed and/or mutilated by the foreign-supported terrorists occupying this Syrian town. 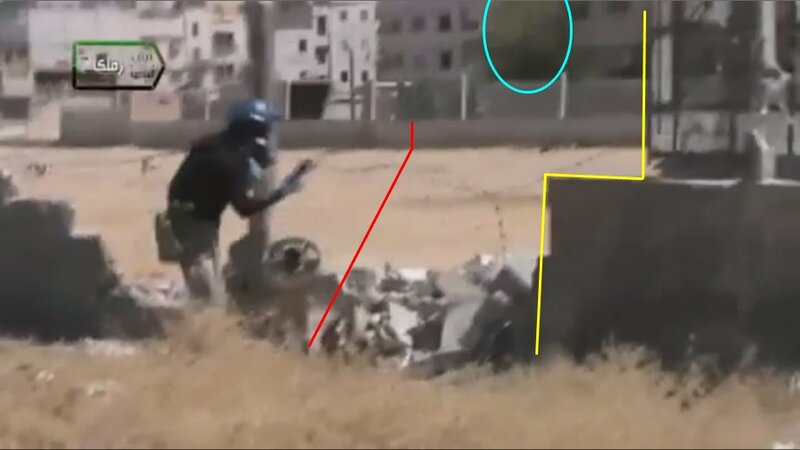 The key here is footage from a CNN video ("Gasping for Life) using unique footage the most famous incident stills are taken from. It's horrible and strange: writhing kids in a truck, arriving from elsewhere at the Al-Rahma cave hospital. They're stripped half-naked and soaking wet already as the White Helmets medics seem to hose them off again in the truck. Most arrivals here are timed roughly in a span from about 7:10 to 8:30 am, with these perhaps being early arrivals; no sunlight is seen breaking across the kids, suggesting the sun is still quite low. Some at least are re-loaded into ambulances and taken elsewhere. Qoppa999 has a numbered analysis, with children #5 and #7 being the main subjects here. 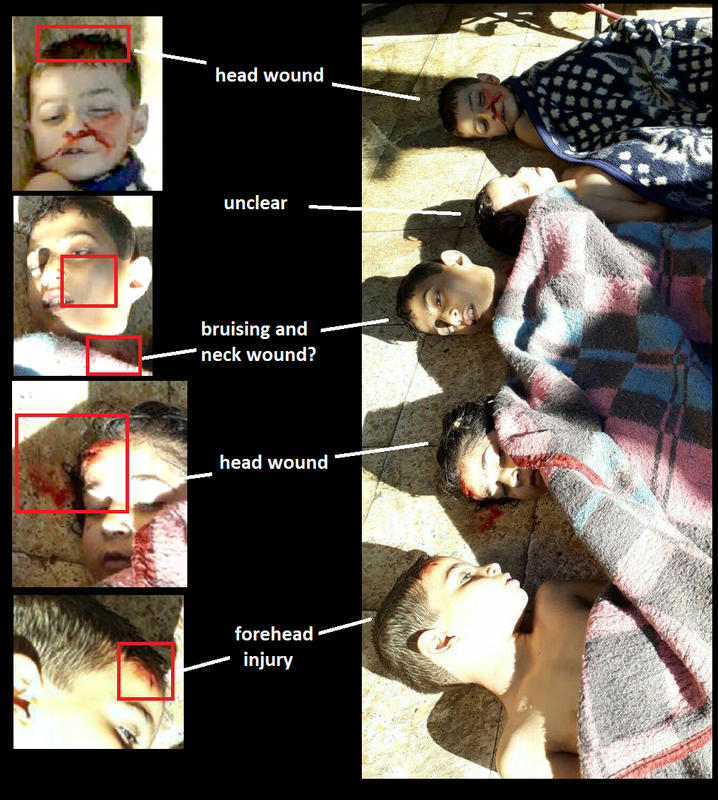 As that tweet notes, "they're among the "head wound children" - but here before being wounded!" And it seems so! Or at least one of them is in the photo we started with on day one (see Islamist massacre part 1, and right). The other might or might not be, but is just as interesting either way. 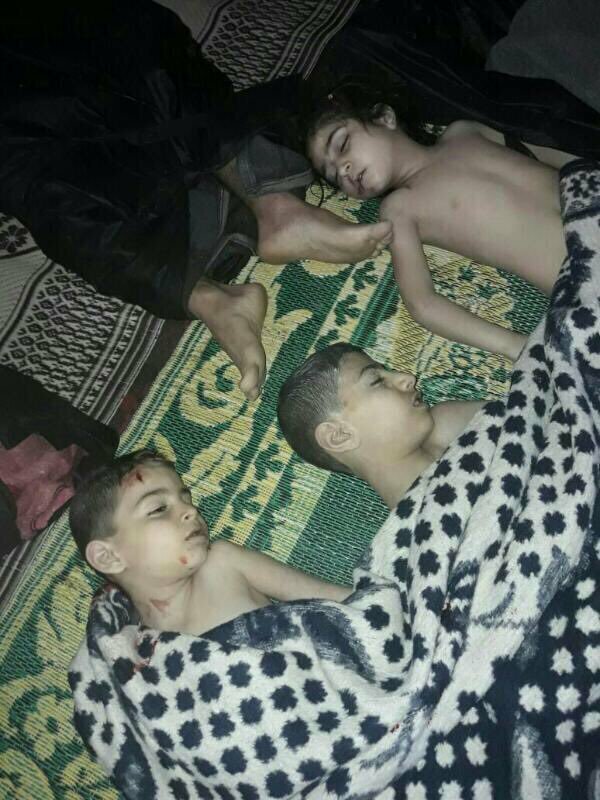 They illustrate just how much concern the humanitarians of Al-Namechange Front and allies had for these victims of "Assad's sarin bomb." If they were willing to mutilate and kill even the children, don't you think they might have poisoned the victims themselves in the first place? Matches: a girl of the same basic age and appearance, same length of hair with at least two yellow hair ties on each side, perhaps same earrings (?). Both views seem to show the same chubby face and same eyebrows (long and mildly arcing in the outer portions, heavier and sweeping down on the inner, similar in shape to the boy's - see below). The mouth position seems open from the side view, but that's the puffy lips to go with the chubby cheeks we see. There are no clear identifiers like a birth mark, but with fashion accessories included, this is a solid match, almost totally certain. 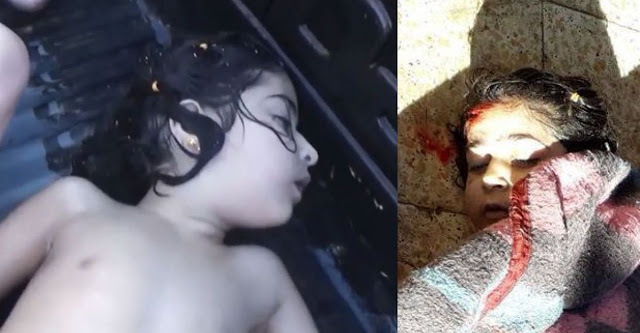 Differences: If this is indeed the same girl, then something in-between views has sliced open her forehead scalp, if not the skull beneath. This is on the right side of her head, the same side seen unmarked earlier. The full size of the wound and likeliness of it being fatal are unclear; this is the best view we get anywhere. In all other later views it's turned more away from the camera. Seeing when this wound appears, we can rule out shelling from the attack, and falling on something sharp when the sarin hit her. This is something that happened after the White Helmets types were making a show of trying to save her life. It seems more like they, or someone allied, violently took it instead. More Differences: Some possible injuries appear after even that (tweet) (photo at ACLOS). But what they are is unclear; they could be abrasions, but appearing near the corner of her mouth and nose, it seems possible it's crusted blood, although we don't see any sign of that in any earlier pictures, or a caustic irritant that leaked out at one point. There's also a possible new mark of the same kind on her right shoulder as well. Abdulrahman Imad al-Deen al-Qadah, age 8. Left: CNN video, victim #5 above. Right: from a photo taken later, around 10-11 am (by sun). Matches: This boy doesn't have the most unique face, nor any clear marks. Yet with two good-quality images from the same angle, we can make a fairly solid call here. I see the same exact ear design, hairline details, and eyebrow shape, the same open eye, and mouth position, same type of nose and chin. The chances of two boy victims looking this similar is exceedingly unlikely, in a pool of about 100 (and no identical twins remotely near this age are reported among them). Differences: someone has torn a small chunk of tissue from his chin, and sliced his scalp, at least, besides other wounds to the head and body possible but unseen. 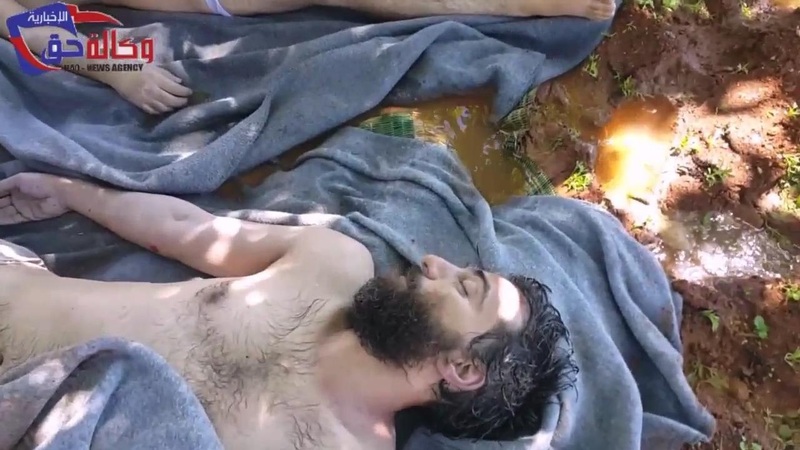 In this case we can see this happened after his arrival at the cave hospital, after Islamist forces rescued him from "Assad's sarin bomb" and were in unquestioned charge of his safety. None of these added injuries seems fatal, but from examples below, I suspect there's a fatal one somewhere that these came with. Most likely everything else was meant to mimic the random violence of "shelling injuries." They would fail, however; shelling can do almost anything, but tends to cause more random damage from shrapnel, flying bricks and concrete, etc. Crushed arms or legs are common, major skin scraping, etc. It doesn't just aim all its sharp fragments towards the head or face and miss entirely with everything else. A Preceding Injury? Qoppa999 reasons this is the same as the boy with the nosebleed, and as I've noted, with a likely-fatal head wound to go with it. 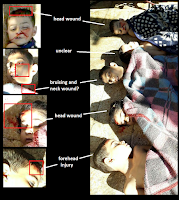 Qoppa reasons that the blood was washed off and fresh wounds added to Abdulrahman's face. However, I doubt this is a valid match, for these differences. 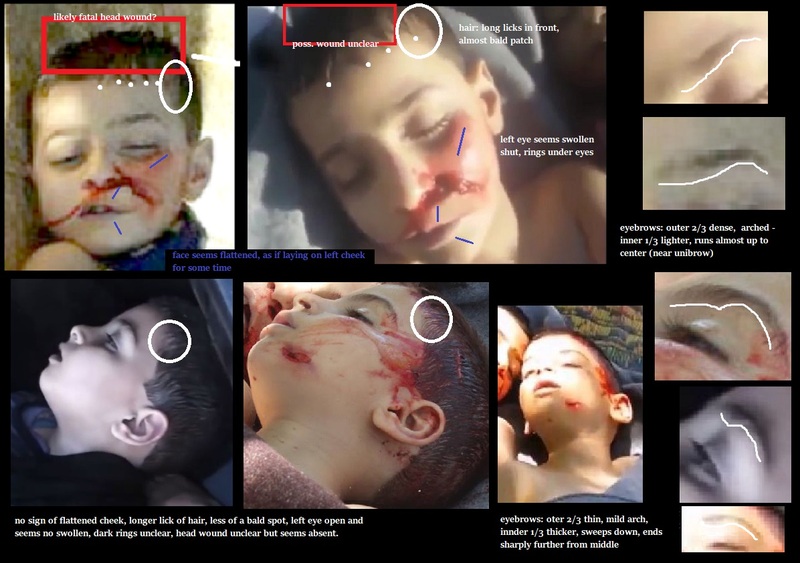 Apparent hair, eyebrow, and other differences suggest to me these are two different injured/executed boys. If so, the one we're looking at now is not included in the group photo above. The wound connected to those blood-filled sinuses seems is likely to be fatal - while there might be reason to add more marks after the fact (to resemble shelling), it seems odd they'd bother wiping off his nose blood first. Further, his apparently flattened face would have to puff back out after these early shots to later show no sign of being laid face down. So I would scratch the middle connection in the top image here. But the left and right images still seem a match, and the second smoking gun head wound case remains. Mohamed Mutilated? Petri Krohn noticed this boy after I started the April 12 post - crop at right from a larger photo of several victims under some trees, which I'll call "trees morgue." (ACLOS). That scene includes him and another boy with even worse fresh facial wounds (ACLOS). Qoppa999 identifies the one as Abdulrahman and the other as his cousin Mohamad Turki al-Qadah. no matches yet to a before image, but if there is one, it would be of great interest. If marks were added to Abdelrahman's face, it's likely the similar hits and hacks on the face of the boy next to him were intentional. That's not just blood from the nose; on close inspection, it looks like they tore strips of flesh from under his nose and the corner of his mouth, leaving the upper lip seeming to hang loose a bit. This was maybe done at once with some two-pronged tool. The lower prong, or whatever, also seems to have knocked out a few of his teeth. What may be just leaf shadows across his forehead and right eye could also include bruising from the mystery trauma. As with Abdulrahman, we don't see much of his body to see what other "shelling" injuries he has, but I guess these and the unseen fatal wound is all it did. So that's likely three different boys with head or face wounds - Abdelrahman, Mohamed, and nosebleed boy. At least one was injured after he came under rebel protection. Most likely none of them was harmed by the alleged bombing, and instead all violence - besides all poisoning - was done by the foreign-supported terrorists occupying the town. At right is a family photo shown to Orient News by the children's supposed aunt (here stretched towards normalcy). Hind (age 5) is seen in the front, and seems a very good match with the girl under study. This, I think, led to Qoppa's ID, and seems to anchor the rest. The others: her brother Abdulrahman (8) cousin Mohamed (age 5?) is holding the camera, with perhaps cousin Adnan (4) next to him, as their father Turki Mohamed Al-Qadah sits in the back. Hind's brothers are not included for some reason. (so not the most relevant image...) Her own father, Imadeddin Mohamed Al-Qadah, is reported as a pharmacist and widower. 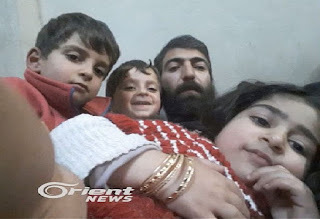 How his wife died is unclear to me, but it's said he and the kids lived together with Turki and his family, with Turki's wife Nour Al-Azraq helping take care of everyone (hence the cousin-inclusiveness we see). The boys in that pictures are harder to correlate, at least for me (Abdulrahman's eyebrows are not very clear). 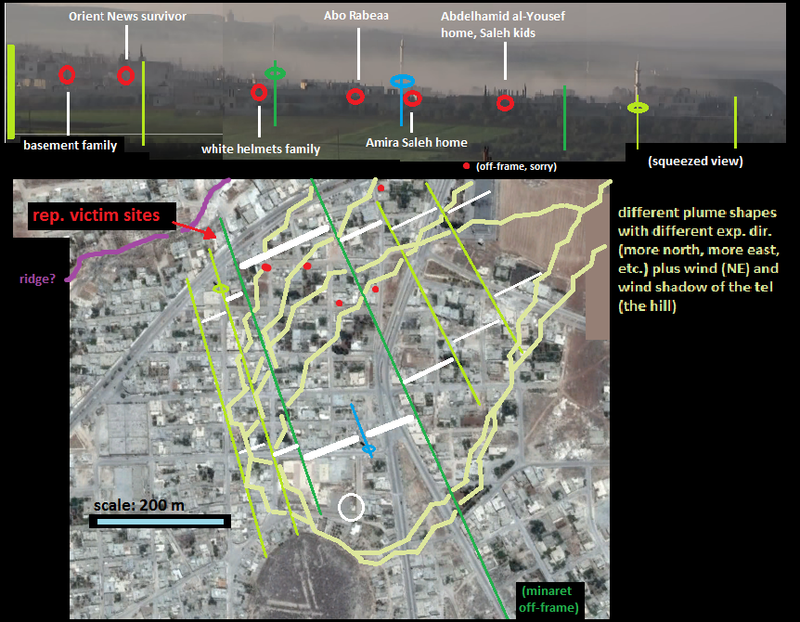 But Hind is quite likely, and the one identified as Abdulrahman is seen in the truck with her, if not in the later 'head wounds' photo. And their eyebrows are very similar. Furthermore, their father Imadeddin may be seen in the "trees morgue," laid out next to what looks like his brother Turki (as seen above, and at right), and a boy we think is the 12-year-old Mohamed Imadeddin (ACLOS). The latter looks quite thin, sporting the face bruise, but unclear about the possible neck wound (see part 3, forthcoming). At about 13, he seems to complete the men's section here. So this all lines up well enough the Al-Qadah ID is pretty sound - a good guess at least, and most likely correct. It's generally a bad idea to take an unmarked "sarin" victim and ruin the effect by hacking their head. One should have a good reason or two for such a move. I'll propose five of them. 1) The patients refused to die on cue - these kids from the same family suggest the kids of this family were gassed with too low a dose - they need to be dead, one way or another, as we saw in the Ghouta chemical massacre 4 years ago - a man who didn't die had his throat cut open (neck injured, fatally) right in the morgue, between video shoots (video explanation). 2) These genocidal Islamists like to use blades and tools on captive infidels and apostates, which I suspect these people really were: Alawites, Shi'ites, Christites, government supporters, other opposition members deemed to be insufficiently Muslim. 3) Injuries could be chalked up to the explosive bombs involved - maybe not realistically, but that's always been optional for Syrian "activists." 4) They didn't think anyone would care enough to dig into their pile of propaganda and find these damning before-and-after matches, like Qoppa999 did. The report from the Organization for the Prohibition of Chemical Weapons (OPCW) on the Khan Sheikhoun incident is now public. (PDF link) A number of interesting points are made, but here I'm interested what they say about the wind. 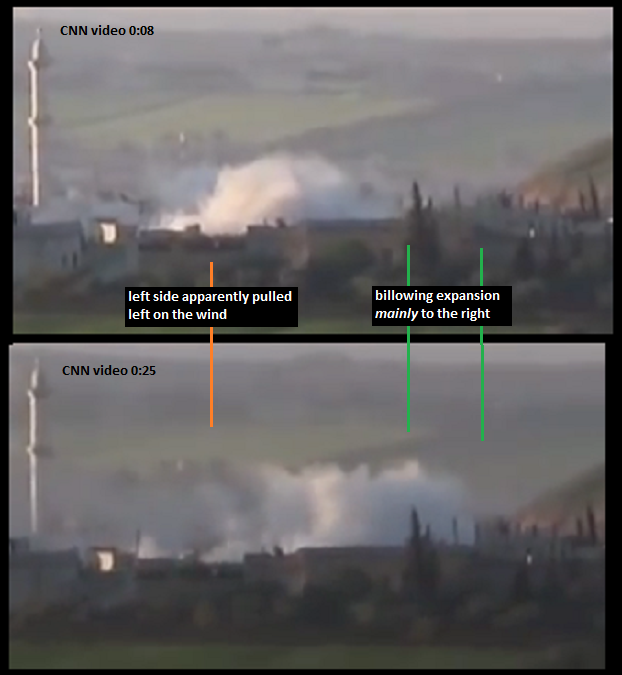 Having invested some time into getting a clear reading from numerous videos filmed at different angles, and having noted in clashes 180° with the opposition's claims (as shown at right and explained here, it blew to the north-northeast, while families were reportedly killed mainly, or entirely, to the southwest). So I remain interested in how opposition-supporting people and agencies handle that problem. Most just ignore the contradiction. This Al-Jazeera graphic (modified), shows the same area we identified (but bigger, showing the entirety of affected neighborhoods). This ignores the wind (which I added in green) and just noted more people lived that way than to the east, almost as if it blew in both directions. But the OPCW is tasked with understanding what scientifically happened. Surely they can' just ignore the wind? Point 5.6 in the report (p.18) explains "No meteorological data was available for Khan Shaykhun, therefore weather conditions were estimated by reviewing historical data from www.worldweatheronline.com and www.wunderground.com in Hama City, Idlib City and Latakia." Of course there are plenty of videos available showing the wind directly. But they ignored that meterological evidence, maybe because it wasn't pre-processed into "data," and chose to rely on limited online sources instead. But these are all some distance from Khan Sheikhoun and only given for the top of every third hour. Knowing the direction, we can see the closest match is seen in Idlib; at 3:00 am it was northeast at 5mph, and at 6:00 NNE at just 1mph, shifting to northwest by 9 am. That's like the prediction cited by Ted Postol for midnight to 3 am, but closer to the right time, and about what we see in KS just a bit later. But having no clue what the real direction was, they apparently chose Hama as the best predictor, and it is closer. "The team estimated the likelihood that the wind was coming from somewhere between the South and the East, but could not be certain." (the map shows Hama's airport reading to the northwest at 2mph at 6:00). "Based on that data, the wind speed was low but with no certainty of wind direction." Low and uncertain could be read as very low and maybe irrelevant, and to the extent it is relevant, it could be almost any direction. This is handy, in context. Because I've assessed the probability of it blowing from the south-southwest to the north-northeast, in the video supposedly from the very time and place in question, as 100%. And I'm certain. The exact heading and speed are debatable, but not the basic direction. (The speeds is not very low, nor very high - estimated around 6-8 mph (a 1 or a 2 on the Beaufort scale), and higher than the other prevailing speeds the OPCW found online). Why the OPCW, with all its resources and brains, decided to forgo the most direct evidence for wind direction can only be speculated on. My guess is they did try it, but didn't like how that clashed badly with the affected area (which agrees with all we've seen - see below). 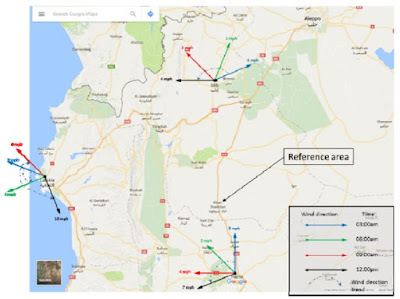 From the vagueness of wind direction, the OPCW turns to "narratives" that include witness testimony in relation to the weather and topography." Witnesses to topography make no sense, but here we learn the OPCW is also considering "activists say" weather reports, and maybe their tip-offs to consider differences in elevation. 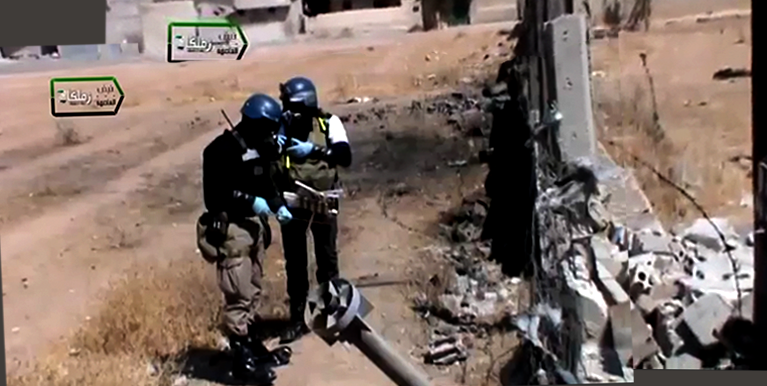 It's unclear to what degree their massacre-concealing trick define the OPCW's findings. But in the narratives, overall, "the weather was sunny, with a clear sky and no discernible wind." (point 5.12) Then what did I discern pushing northeast in all those videos the OPCW ignored? I noted topography as one other factor besides wind in my explainer. In the absence of wind, the main factors in sarin or any vapor exposure will be proximity and topography; those nearest the plume and those downhill will fare the worst. "But," as I noted, "most would say, and many have said about this attack, and it's mostly true - the wind is the main difference in who lives and dies," if there is one. 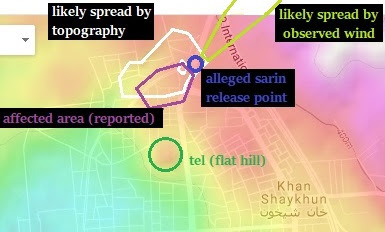 And I hadn't considered topography much until now because it doesn't seem to matter, in light of the obvious wind visibly directing the alleged sarin fog, mostly uphill as it turns out. Figure 4 (p19) is an (exaggerated) topographic map of the town (right). We're looking north here, and he blue area is the basic release point. 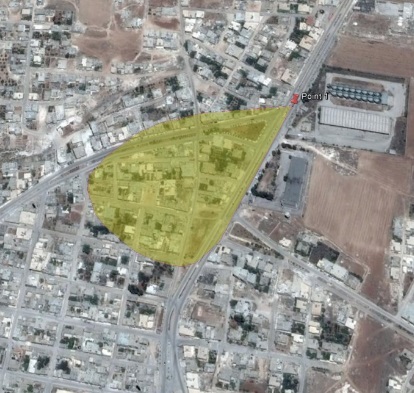 Yellower areas to the left and towards us is what they suggest the sarin cloud sought out, killing those in its path. As they note "A broad description of the topography showed a small downward incline to the south and west from the initiation point." A non-3D version from Google maps I've referenced agrees with this point (labeled version below) - if there was basically no wind, the plume should drift ... not quite into the purple area so much a bit in all directions (the immediate area is fairly level), but favoring a small valley wrapping around the north of that area. But this might be close enough, and it's not opposite of what the opposition reported. <add 9/27>Or it's still way off, but still not 180 degrees. 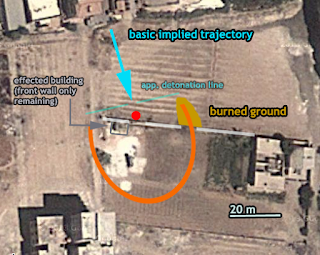 As I managed to just squeeze into my recent Indicter article, the OPCW is even more clearly wrong about the topography, and they may have even realized that and tried to make it look better with some more shifty moves. As noted, the topographic map they used is quite exaggerated, which makes slopes appear steeper and more relevant than they really would be. But even worse, they shift the focus to the wrong spot, which makes it connect to the right kind of slope for their theory. They apparently indicate the release area in blue. What else would it be? Well, by size, shape, and locale, it's the bakery, a bit southeast of the release point. It took me a while to notice that. 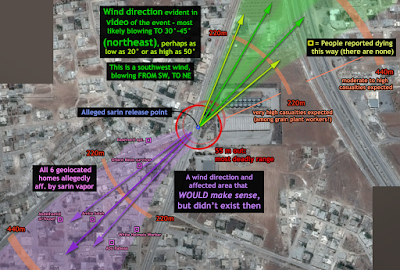 Corrected here, we can see (or open in a new tab if it's too small to see) IF there was no wind, the sarin would not likely roll southwest at all, but only northwest - especially if the wind were a bit that way, as the OPCW decided was most likely! So they make the bakery blue, and hey - it's next to a slope to the southwest. So they chose to ignore the best evidence for wind, found a few reasons to basically ignore it altogether, and apparently settled on topography as the driver of death here. And as it happens, that's a lucky slope for the opposition's story. Figure 7 (right) shows the "origin of casualties, as derived from interviews and recieved [sic] evidence." As we've seen, this pointedly includes no usable wind direction clues. It will include where people were reported dying and being affected. It may not be complete, but should show the main area(s) at least. And, by a curious line of reasoning, this is also just about the topographically-defined spread area they decided on. We can see the wind to the northeast doing the shaping, not that slope. * The smoke plumes analysis is clear, from multiple angles: all discernible wind shaping and movement is to the northeast. 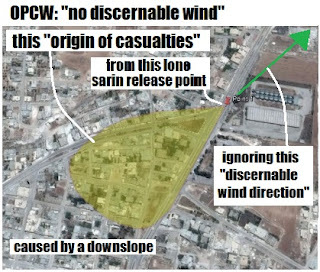 * More relevant to any sarin plume at ground-level: The 'white cloud' of expanding vaopr (ignored in the OPCW report, by the way) has its left side smearing left on the wind (as seen from the north), despite this slope (the right side expands against the wind, I think, because it's in the tel's wind shadow, being just barely northwest of it). * There's also a southwest fog area (also ignored in the report, except to falsely imply it might have been bombed at 6:45 like the other spots). From here, a recently-destroyed farmhouse of some interest (see here), the mystery mist clearly spreads left and towards (east and north), here despite a general if mild up-slope the whole way. It does split around a hill there, and will prefer the lowest path available, but it was dense, spread wide, and rolled primarily uphill on the wind, just like it would do in the north. * It'll roll slower than it would on flat ground or downhill, but visually, it gets there, however fast. The OPCW have poor analysis or distrust the video to make this claim of no wind. ... Why couldn't they just cite the wind like normal? I also wondered "Are they reacting to me? Maybe not, but who else raises the issue? And why scramble to explain unless there's an issue?" Now having seen the report, it's clearly no kind of rebuttal of my findings, just more of their avoidance of the true wind direction. The contradiction is fatal to the opposition story, and reality has issued a death warrant on it. By ignoring this, it seems the OPCW is trying to get the story though alive, out of respect to political agendas rather than to the truth they seem to be sheltering these claims from. 1) HRW witness Ahmad al-Helou: Helou says he "saw the plane drop a bomb and the bomb falling until it hit the ground. The bomb fell in front of the bakery," meaning the famous sarin release point. It didn't blow up, but "he saw the bomb kick up yellowish smoke that spread in the prevailing wind." (HRW report) He would also say the wind must be to the southwest if he were shown the map. He'd clash with the video evidence and lose the clash. But anyway, he cites a wind, not a slope, as deciding where the "dust" spread. 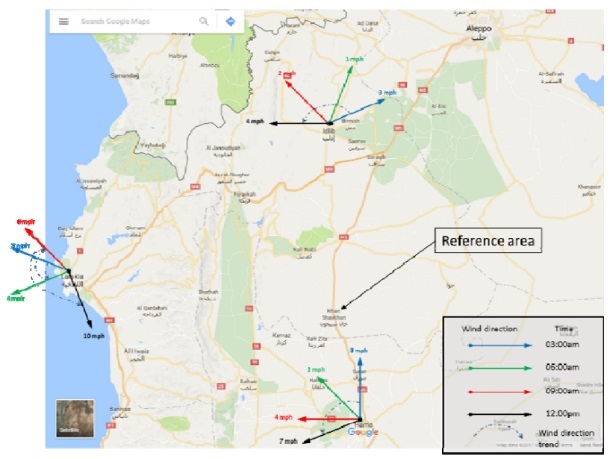 "MIT analyst Theodore Postol notes that the plumes appear to be blowing to the east, in contradiction of the day’s weather reports and the supposed direction of a separate sarin cloud. ... Indeed, if the wind were blowing toward the east – and if the alleged location of the sarin release was correct – the wind would have carried the sarin away from the nearby populated area and likely would have caused few if any casualties, Postol wrote." He's right, and that's a multi-way clash between the opposition/terrorist claims, various predictions, and the video. It's either a problem with the video or with the rebel claims (and with all clashing predictions). Rebel claims are usually lies, weather predictions are often wrong, and the camera doesn't lie, in itself. So here we are. 3) Rod Barton, the Interpreter: Arguing against Ted Postol's incorrect wind direction (a baseless prediction of a wind to the northeast - the same one the OPCW seems to favor as a possible direction, if there were one), Barton wound up supporting the true direction that's now to be ignored, because the OPCW decided there was just no wind direction. "As further proof of faulty US intelligence, he claims that a dead goat found about 40 metres from the crater was upwind and therefore could not have been killed by sarin from the crater. ...With regard to the dead goat, Postol has simply got the wind direction wrong. It is clear from smoke drift shown in a rebel video that the air was almost still in the early morning of 4 April, with just a slight easterly movement above roof top level in the direction of the goat. 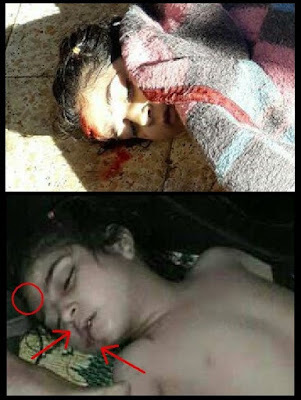 Thus the animal could have easily been killed by the sarin from the crater." 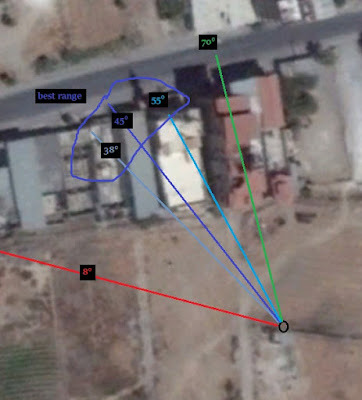 4) Timmi Allen, Bellingcat: In a video analysis posted on Twitter, Allen explains his theory that while higher-level winds are clearly discernible and move to the left (east), there's a somewhat opposite wind at ground level pushing things to the right. But he can only point to one thing this wind seems to blow on, and fails to notice it blows in two different directions. This is the white cloud as it was just starting to expand: the right side is in the wind shadow of the tel (flat hill) and the left side is more exposed to the wind. Hence, the right side billows outward while the left does the same, but also gets smeared on the wind (see graphic above, first made in response to Allen). 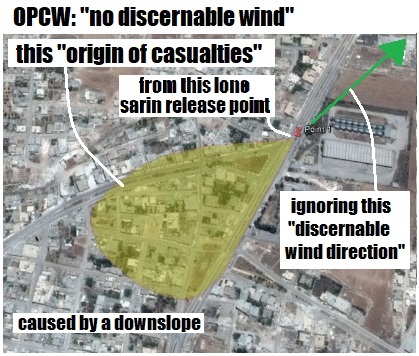 While the OPCW decides there was "no discernible wind," Allen sees TWO different ones, one of which doesn't exit, and the other one of which is fatal to the opposition's story. 5) Alaa Al-Yousef: Alleged witness/survivor, cousin and publicist for the case's star witness and "proof man" Abdelhamid Al-Yousef. As the CBC reported, after hearing from Alaa, he and his family "were lucky, the wind went in the other direction, Alyousef said." He doesn't say what direction that is, but is clear on it blowing towards his cousin's house and others, all southwest of the impact. But when the time is right, their story in general can be as lucky as he says his family was when the sarin blew away from them to the southwest - now there was "no discernible wind," instead of one opposite of what they need, and it was a gentle slope to the southwest that doomed some and not others. At least, the esteemed folks at the OPCW have decided as much, as they scrape for reasons to blame the Syrian government and absolve the foreign-supported terrorists there for the ongoing massacres of Syria's people. 6) Added 9/27: from SNHR report: Hala, 26 “The wind sent the gases away from our house, which reduced the concentration of the gases in our house area, as the effects on me and my family were less severe compared to other areas. However, I was affected suffered from gas symptoms." Is that the implied wind to the southwest? The opposite one to the northeast seen in videos of the event? The one likely to the northwest but not "discernible," like Hala thought she had discerned?